This House was named after the famous Saint Columba. 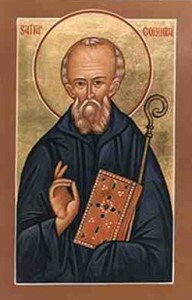 St. Columba 521c-597c, was born in Donegal Ireland. It is thought he was of royal descent. He studied at Moville under St. Finnian then in Leinster at the Monastery of Clonard under another St. Finnian. He was ordained before he was twenty-five and spent the next fifteen years preaching and setting up foundations at Derry, Durrow, and Kells. Possibly because of a family feud which resulted in the death of 3000 people and for which he considered himself partly responsible he left Ireland at 42 years old and landed on the island of Iona off the coast of Scotland. There he built the monastery which was to become world famous. With SS Canice and Comgall he spread the gospel to the Picts; he also developed a monastic rule which many followed until the introduction of St. Benedicts. He died on Iona and is also known as Colm, Colum and Columcille. His feast day is June 9. The House members wear red tee shirts. “2 4 6 8 who do we appreciate Columba go go Columba, footy and basketball we got it all Columba go go!” You will hear us chanting our rap song at Sports Days and House events.